Our product range includes a wide range of distance meter w laser pointer. 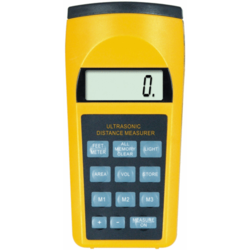 Distance Meter W Laser Pointer is a perfect tool to quickly know the distance, area,and volume of a room. Your distance measurer transmits ultrasonic waves to a point you want to measure. Afterward, it measures the time taken by the waves to reflect and then calculates and re-transcribes the distance. Looking for Distance Meter W Laser Pointer ?